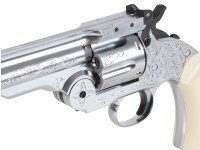 Based on an original hand engraved S&W American attributed to the legendary frontier scout and showman, Texas Jack Omohundro, this very special, limited edition Schofield .177 caliber model has been created by the master engravers at Adams & Adams using a Nimschke vine scroll pattern and punch dot background similar to the S&W presented by Texas Jack to the Earl of Dunraven in 1874. 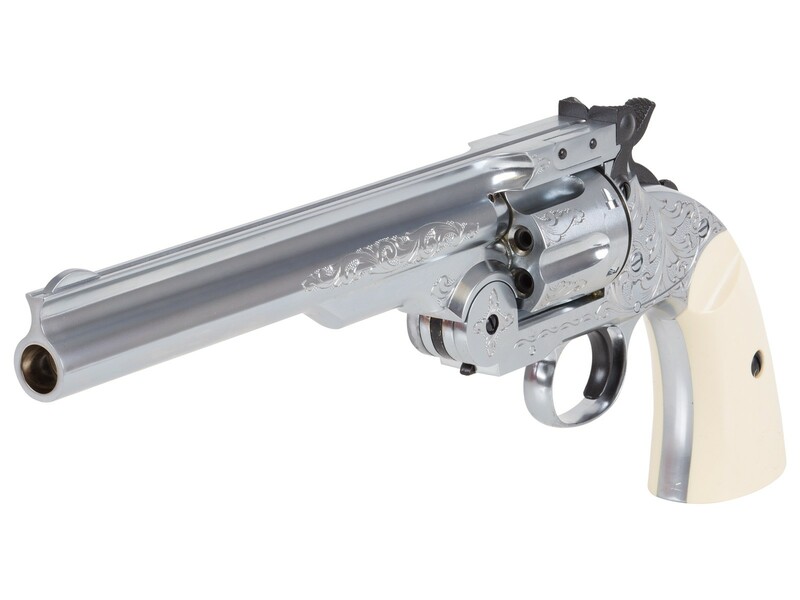 As the story goes, the adventurous Irish Lord was Texas Jacks most enthusiastic hunting patron and in 1874, on their third hunt together on the American Frontier, it was decided that since Texas Jack had an S&W American, the Earl should have one as well. 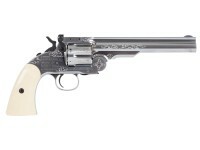 The gun was handsomely engraved in the elegant New York style employed by craftsmen such as L.D. Nimschke, nickel plated and fitted with ivory stocks. A Southerner, Omohundro had a distinguished Civil War record serving under Generals Fitzhugh Lee and J.E.B. Stuart. After the war he became a scout and befriended such western legends as Wild Bill Hickok, and Buffalo Bill Cody, who he first met in 1871 when he hired on as a scout with a hunting party that included the Earl of Dunraven. Omohundro and Cody became fast friends and when Cody started his first Wild West performance in theaters, Texas Jack became a key player in the early troupe. He left the show in 1876 to write and perform on his own, along with his Italian born wife Giuseppina. Texas Jack died in Leadville, Colorado, in 1880, at the young age of 34. His role in the American West, his friendships with Cody, Ned Buntline, and Buffalo Bill, among others, made his name legendary. The Adams & Adams hand engraved nickel plated .177 caliber Schofield has the engraving inked in for fine detail and will be limited to just 100 examples. Things I liked: Engraving is outstanding with beveled edges and no copper base cote exposed that I can see. White grips actually have what looks like a bears head and 1877 is on the left side molded into them. 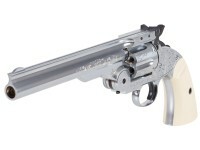 Things I would have changed: Pistol is very well made with nothing loose or wobbly, grips are precision fit and tight. Nickel finish is perfect. Nothing to change. 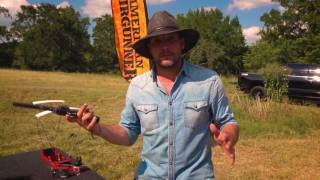 What others should know: And now for the disappointing items. There is no black inking to enhance the engraving as described in the description. The pictures of this pistol are very deceiving. There is nothing extra blacked out, it's just the same as the plain nickel version. The most disappointing thing is that a majority of the displayed engraving is missing. There is nothing covering up all the Warning print behind the cylinder on the right frame side like in the pictures. Just some engraving in the open areas around it. Not bad but definitely not as pictured and I feel cheated out of a large amount of engraving, as on the left side, that truly would have enhanced the pistol a lot more. I will send a picture in for display above. I have not fired it yet. 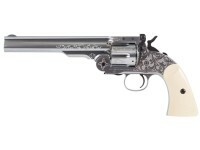 Beautiful revolver ,BUT i'd never pay that kind of money when the one whole side is crapped out with warnings , just saying. Looks like they replaced the original picture of the customized gray one with the one you will receive. PA or the manufacturer need to come up with appropriate packaging before I shell out $550. 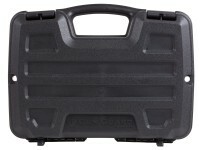 It comes in a Plano Gun Gard SE plastic lockable pistol case. Anyone believe Pyramdair will actually slip a $550 engraved masterpiece back into a "destroy to open" blister pack?? There is no mention of any special box of any kind. (At least the Colts come in their standard printed box for $350) A used blister pack would be a crime! One can only hope PA steps up!